There’s two main types of Fae Yule minion adventures: chains from the RIFT Store and the 10hr Promo adventures. There’s 6 new minions added to the latest Fae Yule World Event. The first one is Grish which you get from the RIFT Store -> World Event for 10 Dark Icicles + 500 Unique Snowflakes or 750 Credits. The rest are obtained from a minion adventure chain that is triggered when you collect Grish and starts with a 1min adventure called “Fae Yule is here! Grish has come to bring the hate!” that only Grish can complete. Note: The attributes for the 2015 Fae Yule Chain minions were adjusted after RIFT 3.5 Hotfix #2. There are no longer any cards with a max attribute value above 25. You can see the old max attributes here. 1min Fae Yule is here! Grish has come to bring the hate! 1min Spread some Fae Yule cheer to stop Grish! 15min Defeat followers of Grish. 15min Show everyone the festive festivities with Atrophinius the Festive. 15min Gather food to set a trap for Grish. 8hr Locate dimension items to hand out as Fae Yule gifts. 5min We’ve located a village that needs cheering up. 5min Grish is near, hunt him down! 5min Use fire to melt the ice blocking the way to Grish! 5min Gather food for the poor villagers. You might get a few more 5/15min and perhaps even 1min Fae Yule adventures, but they are just a little extra that don’t count towards any new cards. Note: You must complete and collect the previous Fae Yule adventure to proceed to the next one. Tip: If you are planning on completing this chain over several days, I suggest copy-pasting the table into an Excel spreadsheet and highlighting adventures you’ve completed so you don’t get lost. 10-25 Unique Snowflakes event currency. Chance of a Dark Icicle event currency. Jingling Bell, which contains some Unique Snowflakes and chance at Fae Yule food. Fae Yule new and old dimension items. Fae Yule costumes and weapon skins. Limited Edition: Merry Mink Trove. After you complete the 2015 Fae Yule Minion Chain, you will be able to go on a 1min Fae Yule adventure called “Grish has been banished from the land for now”. It has a similar loot table to the 10hr Fae Yule adventures and player reports mention you can get it every 5-20min if you are spamming the 1min adventures. Be sure to send your best, closest-attribute-matching minion through the adventure as it has 6 reward tiers. Fae Yule 2014 also had a minion chain. This was previously for Credits-only, but you can now obtain the starting Minion Card: Rudy for either 3 Dark Icicles + 250 Unique Snowflakes or 500 Credits. As the 2014 chain was close to when the Minions System first launched, most of the cards don’t have very promising stats. Yulogon and Greathfather Frost would be the exceptions. The pattern for completing the Fae Yule 2014 minion chain is the same as the 2015 one. [Warning: The 2014 chain is currently bugged this year, rewarding players with Summerfest’s ‘Keavy’ minion card and Summerfest Merit Badge currency if you complete the Ivory-rewarded 8hr adventure with a 4-star rating. Will be fixed on 16th Dec’s hotfix]. You will need to collect the minion card Rudy to start the chain. Only Rudy can go on the “Where’s Greatfather Frost? I think that he’s missing!” adventure. 1min Where’s Greatfather Frost? I think that he’s missing! 1min Gather your minions, and go on a mission. 8hr Is he trapped in the webs that the spiders spin for us? 15min Cut open this mummy with the Axe of Atrophinious! 15min To search from up high, we’ll need an eye in the sky! 15min The team is assembled, Find Greatfather Frost! 8hr I’ve spotted Frost, he’s held by the maw! 5min We’ll be heroes, sung about by bards,. Let’s take out the guards! 5min Yulogon, smash into the door really hard! 5min Arrows from the tower rain down into us. Charge, Atrophinious! 5min Ivory’s flapping can help the sleigh get lift! There might be one or two more 5/15min and/or 1min adventures once you get Greatfather Frost, but these don’t count towards another card. If you haven’t done the 2014 chain yet, I do not recommend doing both the 2014 and 2015 chains at the same time. You are bound to end up confused with which step of the chain you are at for each. Once you complete a chain, you might still end up with some 5/15min adventures that are just additional bonuses. This could potentially confuse you, so be sure to check both 2014 and 2015 adventure chain names if the next Fae Yule adventure you come across isn’t part of the pattern. For instance, the 1min “Grish has been banished from the land for now” and the 5min “Someone get Atrophinius a drink” appear after completing the Fae Yule adventure chains and are not part of the pattern for either the 2014 or 2015 chains. The 10hr adventure slot will contain 6 Fae Yule promo adventures in its deck. These will reward event currency and may also drop event-related items. As they are 10hr adventures, they cost 250 Aventurine to send out. Loot gained may depend on the star rating (1-6) from your adventure, which is in turn determined by how well your minion’s attributes match the adventure as well as a dice roll value. (You can learn more about how rewards are determined here). Possibly loot includes Unique Snowflake and Dark Icicle currency, food, dimension items, pets and wardrobe items related to Fae Yule. 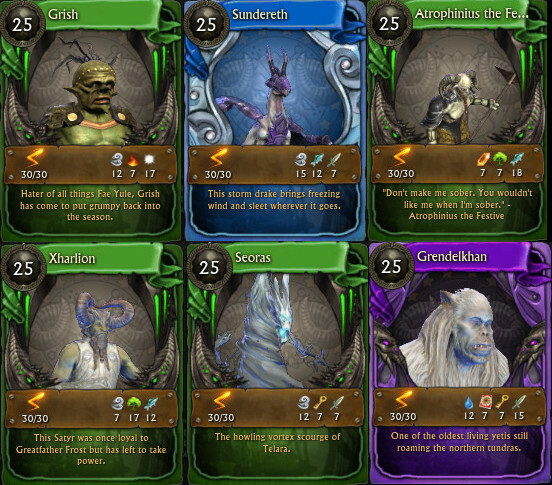 If you are interested in information on how to obtain all the minion cards in RIFT, check out the Minion Card Database, which lists all minions, attributes, max attribute values and where to obtain them.